This is the documentation page of the THBusiness WordPress Theme. We will try to keep everything well documented. If you are not sure about particular area of this please use the support forum. Select the thbusiness.2.0.0.zip or thbusiness-pro.1.0.0.zip ( If you got pro version ) file from your computer and click Install Now Button. After successfully installed the theme click “Activate Theme”. Then please navigate to “Dashboard > Settings > THBusiness Pro Theme Activation” to enter your API key and API email. After entering the details hit the “Save Changes” button. Go to Appearance > Customizer in the WordPress Dashboard. Under “Site Identity” section there is a setting called site logo. Press select image button to choose a site logo. Then choose how to display the logo from “Display site title / logo.” setting. Click “Save & Publish” button in the top of the customizer. Follow the steps to activate home page slider.Slider will display in the front page of the theme. You can add 5 slides for this theme. Go to Appearance > Customizer > Homepage settings > Homepage slider in the WordPress Dashboard. Mark the check box under the heading “Display slider on homepage” to activate the slider. You can use this to turn on or off the slider. Use “Select Image” button to add a slider image. Fill the slider title, slider description to display a slider title and slider description. Then fill the Slider Redirect Link – It is the link of the web page that you want to go when the slider button or title pressed. Fill the slider redirect link button text. After adding number of slides you want click “Save & Publish” button. Give it a name whatever you want. eg : Business. 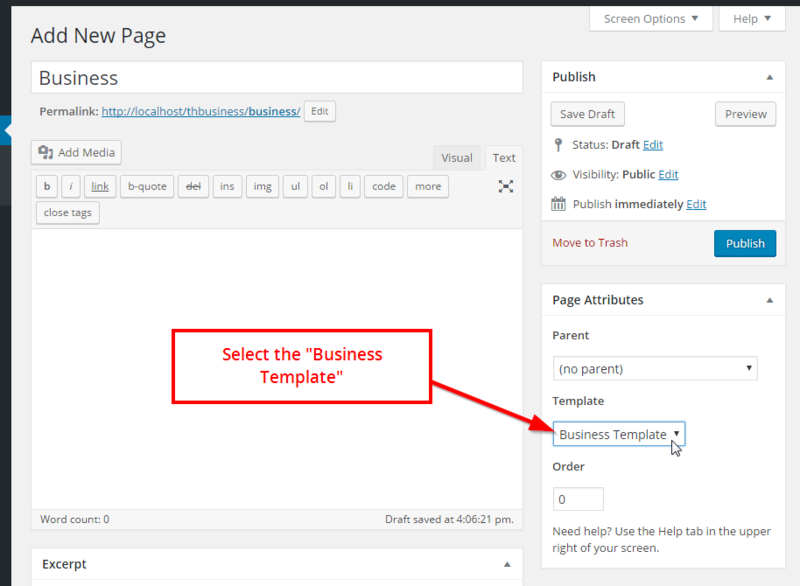 Then from the page attributes options box select the Template as Business Template. Adding a blog post page when business page is activated. Then Select the page that you created from the “Blog Page” drop down . eg: Blog. There are 6 widgets that you can display in the business template. This widget can be used to display the services of your business. You can display a small font awesome font icon or small image icon. If you want a image icon go to the page that you display as the service item and set a featured image. If you want a font awesome icon go to font awesome cheat sheet then find and give the name of the icon that you want, to the icon input field. After that, select the page that you want to display as the excerpt of the service widget. It will display the automatically generated excerpt. If you want a manual excerpt then in your page editor screen after the editor area you will see a area to add a custom excerpt. If you cannot see it, activate it from screen options. That’s all.Services widget is perfect for Business Template Top/Bottom Areas. 2. THBusiness Call to Action. Displays a call to action. Perfect for Business Template Top/Bottom Areas. 3. THBusiness Recent Work Widget. This widget displays pages as recent work. It will use the featured image of the page as the image of the widget and page excerpt. You can on or off the page excerpt if you want. Use for Business Template Top/Bottom Areas. 4. 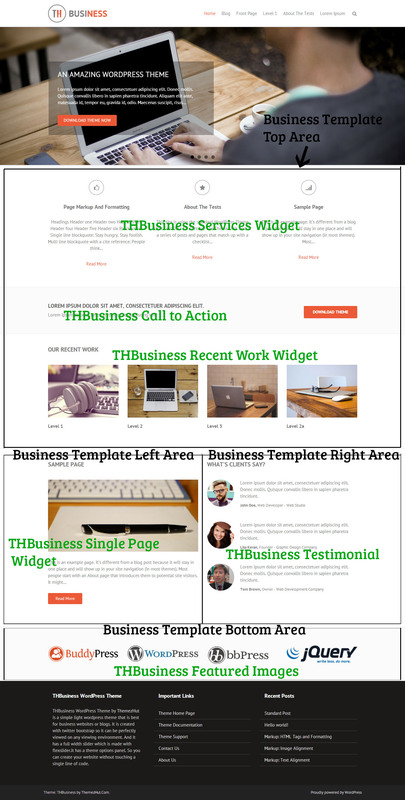 THBusiness Single Page Widget. 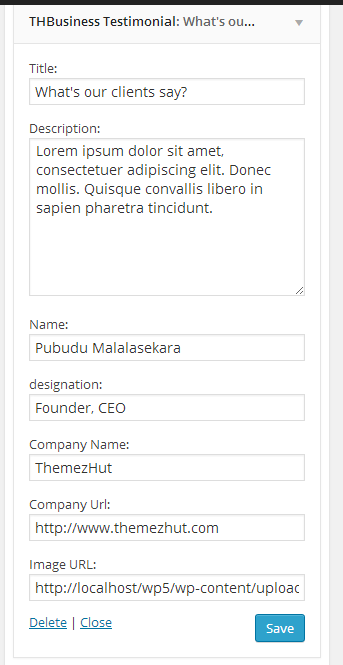 As the name suggests this displays a single page in the business template area. Choose the page that you want to display from the drop down. It also uses the featured image. Drag and drop this widget to the Business Template Left Area or Business Template Right Area. This displays testimonial. Use this widget any amount of time to display multiple testimonials. Drag and drop this widget to the Business Template Left Area or Business Template Right Area. Business template consists with 4 widget areas. Drag and drop each widget to the relevant widget areas and arrange them any order you want. Following image shows the widgets and widget areas. Do you really like our theme? It will be a big help for us if you rate our theme. Go to rate the THBusiness WordPress Theme. Hi there, the theme has been great for my client, thank you! Also is there a good way to increase the font size on the menu at the top? I am really sorry for the late reply. You can paste the following code in the Additional CSS area of the customizer to change the size of the icon. If you want to increase the size more just change 100px to any size you want. And don’t forget to ask questions by the email or at least mention the email that you used to buy the theme in the email. It will be a lot easier for us. I just replied you via email. Could you please reply it? Hello, is it possible to remove the Theme name and link in the footer, please? Please go to Appearance > Customize > General Settings and add your own footer text from “Footer copyright text” box. It will remove the default one. Are you using any caching plugin? If so try to clear the cache from that plugin settings. Could you please send me your URL? I added a column to the footer in an attempt to add an additional sidebar to my CHILD theme. The widget (footer-social) shows up on the backend, but it is not displaying the custom menu I created for it. Instead, it just shows the general sidebar. Really happy with this theme, tried a couple others before and this is the first one to really “work” for me! Quick question, I’m trying to use the THBusiness Services Widget, but default WP content keeps getting in the way. Either the static front page or the posts page is required, and with either selected, the page shows up against the left margin and pushes the Services Widget off-center. How to resolve? I could do without a static front page or a posts page. You have placed the widget in the wrong widget area. The widget is currently in the main sidebar which is wrong. Those THBusiness widgets should be placed on Business Template Top, Left, Right, or Bottom areas only. However in order to display those widget areas on front page you you need to create a Business Homepage first. Please read the documentation to learn how to build a business homepage. The problem automatically gets solved after i placed a contact form in the sidebar. Thanks. I have built up a site konceptionengineering.com with the free version of TH business. In desktop, horizontal scrolling is observed. Why is this happening and how do i get rid of it? You can use custom css to change colors. change the background color and text color easily. Just copy and paste the following code in the custom css area of the customizer. Then change #ededed value to any value you want. This is great, thanks so much for the help, if I may ask for another help, is there a way to change the font style of the text that appears in the gray box on the slider of home page above the Read More button please? I’d appreciate the help again. Sorry but also is there a way to change the font and the size of the main navigation on top of page please? Thanks again. Can you tell me how to rename – “Main Menu” of mobile version of the theme? I don’t want the text to be in english. How to make it? You can do it via translation. Please update your theme to 2.0.5 before translate. I want to create contact page but when i created it it show =s all the fictures of the home page. It is because you have selected the “Business Template” for the contact page also. Go to page edit screen of the contact page and select the “Default Template” from the page attribute box. You can edit the js file to do that. However in THBusiness Pro we have included that feature to it just from the customizer. How can I change the text “Read more”? How can I change “Read more” text in services and in single page widget? Using the THBusiness theme slider. What size picture works best for the slider? For example 1688 x 1125 or 6000 x 4000? You can change the picture size that matches your site. However in the demo I have used 1920px x 655px size. I want to get my business testimonials in the business template right area. However, when I select the right area and add a testimonials widget they appear on the left :s Any idea why? Hello, how do I substitute Pinterest on the social media menu for one of the options I don’t need? I am not able to categories from my home page…how to remove it ? Anyone can help me with translation of widgets, footer and header of this theme with qTranslate-x plugin? The slider appears way to big when i upload an image to it how do i adjust the size of the slider, the image size does not affect it. Bussiness page template doesnt work? Is it because I am usung free version? No it is working on the free version too. when I set page template as “bussiness page teplate” nothing is displaying?! I made empty page with business template, set it to be static front page and then imported widgets.. This doesnt work for me as well. I have added the widget in the main area. Hi, I recently migrate to other server my website made with thbusiness, but all settings of template are missing.. (I migrate manually files and db).. How I can sove ? Could you please tell me what version of the theme that you was using? I have already resolved by setting all the parameters again .. it was not much to do, but I wonder why it all went lost even though I’ve transported everything manually and connected the database that had the right parameters .. I made a cloning..
It’s a great theme. I now would like to create a child theme for THBusiness. Is there a simple way to do so? Please help me. I can’t put html links in my website. I’ve got TH business. When I put an html link in my slider, it always puts my domain name in front of the link. Can I have a site title and logo displayed in my site. I can only choose image or text. I wants the “THBusiness Recent Work Widget.” to be replace with the recent 4 blog post can we do that ? I try to use TH Business theme. IT is great and completely suitable for my idea. However, I have an issue. When I added pictures on home page slieder, it is shown very big and I could not make it smaller. How can I change the height? In your demo, it is much smaller. How do I delete both the search loupe and the text allocated at the bottom area? Thank you for a very good template. Please help. Where can I change the “Read More” to another inscription? How can I slow down the cycle of the slider? and also the speed that it jumps across Right to Left? Right now it cycles about every 7 seconds and I would like to make it 9 seconds. It would seem I could do this in the editor but did not see where the reference was to slider speed. Great theme – thanks. Is there any CSS code to make the logo area taller than 87 px as it isn’t high enough to properly show my logo? Is there a way to remove “Proudly powered by WordPress” from the footer? Yes you can remove. Please see the theme options. Hi, Where can remove all comments box from all of the pages? Hi, That option has not included with the theme. You have to do it manually. How to do it manually? Go to page/post create or edit screen. Click screen options button in the upper right corner. Then check (mark) the comments checkbox. After that you will see a meta box named discussion bottom of the screen under the editor. Unmark the two checkboxes and save/update page or post. Thanks, it work like charm. One more question, how can i remove the search box in the page body? Thanks Pubudu. Your reply most helpful for me. How can i remove breadcrumbs ? Please help me. Hello Rasel, This theme does not have breadcrumbs. Do you mean page titles? If so you can hide it by css. Paste the following code in custom css area or in your stylesheet. How can I add some text on the home page? Hi. How can you give me place in CSS code, where i can make slower slider when change picture on webside? Hello, how do I add more than 5 pictures to the Slider? Hi how do I add the copywright symbol to the footer i treied using code such as: © but it didnt work? 1) How do I make the header logo bigger, under Theme Options? It says “Most suitable dimensions are 293px wide and 87px height.” but I need this bigger to reinforce the brand. Seems too small–it’s smaller than most text in the website since my logo has text itself, it has to be bigger. 3) Featured Images Widget – how do I remove the “clickability” of the images? I only intend to put the images and not have them direct readers to a link when clicked. When you hover the mouse it shows the thumbnail icon–I don’t need the images to be clickable. Thank you and looking forward to your reply. I’m no CSS expert and it would be great if you can help me out soonest. Hey I don’t know if you figured it out yet but for your third question, when you upload the image there is an option on the right that says “Link to”. Select the option of none and then it wont have “clickability”. Dose this come with a contact widget to place on the home page side bare or a page roll? There is no any widget. You can use contact form 7 plugin for pages if you want. Hope you can help me with my concern stated in the comments section. Thank you. Je me rends compte que j’avais mal écrit un mot dans mon commentaire précédent. Sinon je veux parler de l’affichage des icones d’email, de téléphone et des liens sociaux situés en haut de la page. Il y a des moments où l’affichage est correct et d’autres moments où les icones ne s’affichent pas correctement. Oui. Il semble qu’il y ait un problème avec elle . Est-ce que vous utilisez la dernière version? Trouvé la question . Il est avec votre plugin de cache . Supprimez tous les caches et se rafraîchir. Il faut résoudre le problème. Le probleme vient être resolu. J’ai collé le code dans css personnalisé et j’ai desactivé tous les plugins de cache. Je ne sais pas cependant qui est au juste le responsable du probleme. Si je le trouve je vous en ferai savoir. Merci infiniment! Maintenant, le problème est résolu . Mais vous n’êtes pas obligé de désactiver les plugins . Il suffit de supprimer les caches et se rafraîchir. Il happend parce que le plug-in de cache en cache avait pas la police ” de police -awesome ” avec elle . Quelle est la fonte des icônes. Do you have the CSS code to remove the page title from the static home page? Add this to the Custom CSS area. Thank you very much, that worked for the home page. Now I have two more pages: Discovery Page, and Contact us. How do I do it for these? Hi, If you don’t want to show page headers in every page just paste this code. Merci pour ce theme qui répond à toutes mes attentes. J’ai un petit souci concernant l’affichage des icones dans l’entete: icone téléphone, icone email et les icones sociaux. Parfois ils ne s’ffiches pas correctement; comment puis-je resoudre ce souci? Merci! Bonjour, Pourriez-vous s’il vous plaît expliquer ce que vous entendez par cela ne fonctionne pas correctement ? Est-ce que sur la couleur ou quoi? Merci . How to I make the page name (HOME) NOT display on the page? Your template is really very nice and I am trying to use it as a newbie. I added some menus, but unfortunately I could not change the page name for “Home”. I can not find it anywhere (under pages). Would you please help about this issue? Hi I am using this theme but I would like the menus to look like the same as this site : http://www.charlottepipe.com. The blue area at the bottom of the website I mentioned… Need it thinner. thanks. Hi, can I change the size of the slider on Homescreen? Yes Roland, Size depends on the size of the image you upload. This doesn’t work for me. When I upload a more narrow image there’s just a large white space below with the navigation arrows within this space. I love these theme but I really want to cut the size of the slider in half. How do I do this? good morning I can not activate the comments box on this page, someone could tell me how do you, as I did in tickets fast editing and have ahi assets comments but every time I go to my page always tells me that I must Login to posting and what I need is for my subscribers leave comments thanks. How to edit language files to change the messages and descriptions displayed in this theme? When I edit a line in the original default.po file (/themes/thbusiness/languages) nothing is changing on my site. For example things like “Leave a comment” or “Read more”. Looks like the language file is not loading at all. Or maybe I’m missing something? I have found the video Pubudu podsted before about language files and it helped me with that. But I have one following question: how to adjust site width. The layout has huge fonts and lots of padding so not much content fits in the fields. Where should I look for the overall page width and the content area width? Can you post a link to your web site? You might need to reduce the padding on the menu items. Thanks for your suggestion. I’ve tried to reduce padding, but that’s not what I’d like to achieve. instead of the negative margin-left. Hello Pubudu, first of all thanks for this great theme! I really love it. However, I have an issue: I’d like the main menu to be displayed on one line only, but it keeps displaying on two lines while there’s plenty of space left on the left side. I have tried various lines of code, but none helped. What can I do to display my menu on one line (i.e. reduce the left margin) ? Thanks for your answer! Hi, really nice theme and great documentation! But… is there a simple way to turn off “Leave a reply” on pages not using the “business” template or does it need to be done in the php? Sorry, ignore me, “Discussion” wasn’t enabled in the “screen options” so I couldn’t see it. I have turned that on and now can enable/disable it per page. There is not a simple option to do it. You can do it by disabling comments in each page or editing the php code page.php. To edit the page.php code you have to first make a child theme and remove the comments code there. You provide great support for a free theme! Hi, but i do have an other question for this great site. The links in the text are uncollered. This has great effect on your bouncerate of your page. Were can I change the linkcolor so it will be noticed by my viewers? Click on the “Custom CSS” tab and add this to the window – obviously change “red” and “green” to colours that suit your site. indeed. I had to change the value in the php. Hi, There is a big wite gap between the slider and the business template top page. I tried to fill it up with different widgets. It is nog working. Hi, It seems you have done it by yourself. Now I cannot see any white gap. a very nice built website i have to say. Please i’m having a issue with the blog, first i would like to know if its possible to have a full widht blog page without the sidebar and second if its possible to show in the blog only posts of a category blog and not all posts. Hi, I like the theme thus far, just had a quick question. I actually noticed that several others had tte same question but I wasn’t able to locate an answer in the thread. Is there anyway to remove the “Comments” (Leave a reply) section from the bottom of the pages? It shows up on all of the pages except the Home page which I used the Business Template but on the other pages where I used Default & Full Width templates I keep seeing it at the bottom. Hi.. How to add widgets on the front page? Top Area, Call to action and featured images.. Thanks in advance ..
Is it possible to change the colors of this theme? Love the theme but client not a fan of the black bar, are there options? Thanks! How do we remove the comment section on the bottom of every page? Hi.. I would like to add full page layout on some specific pages and deactivate comment options. Also I have added featured images but how to bring them on front page? How are you doing? My slider images are blurred. What should i do? I am training on how to use WordPress. Thanks in advance. Hi.. Joram. Pls use high resolutions images..1200×550 woudl do best!! Hello, we recently installed the thbusiness theme on http://www.musictalk.org, however, the theme icons, such as the social media icons, search icon, and return to the top icons are all missing. please visit http://www.musictalk.org to check out the issue. You appear to be loading the font-awesome css twice. Once from the theme, the other from the bootstrap CDN. I figured it out how to get to ‘business template’. sorry. When creating a page (business etc) need to verify screen options at top and ensure ‘page attributes’ is checked/ticked and then the options become available in window to the right. For now I want straight pages, no posts. I am having difficulty removing the ;leave a reply; window that appears on the ‘static’ page I have created. I especially don’t want the ‘blog look’ on the home page. I want it to look as clean as the template and right now it is messy. 1. para los que no sabemos de codigos HTML como puedo cambiar TH business services widget y poner una imagen personalizada de mi escritorio en vez de un icono de http://fortawesome.github.io/Font-Awesome/cheatsheet/. 2. no se si ya se dieron cuenta pero en el TH Business Single Page Widget que es para los post del blog la opcion del boton de READ MORE no se puede cambiar a español, como puedo hacer ese cambio?? 3. segun un comentario que vi arriba se puede personalizar el pie de pagina, pero en las opciones del tema no aparece nada para realizar esta opcion, como puedo modificarla?? si fueran tan amables de indicarme las instrucciones paso a paso se los agradeceria, muchas gracias existos. 1. Is it possible to adjust the height of main page slider? 2. I would like to set bigger font in top page menu, tried with editor, but no luck so far. 1.) Yes. height depends on the image height that you put into the slider. 2.) Make a child theme and change the font-size of the particular element of the stylesheet of the child theme. i have a one question. how can i use the horizontal black bar listed at the bottom? such as important link, recent post.. is it a widget? I like the theme overall, but have a couple difficulties with it. First of all, if one does not know how to write code, should one do anything in the ‘Editor’ section, or just leave it all as it is? Secondly, in the ‘Widgets’ section, how do I change the headings from H1 to something else (i.e. : H2, H3, H4, etc.)? As it is now, every time I insert a Widget, the heading defaults to H1, which means my front Page has wayyyyyy too many H1’s for the Search Engines. I agree with that but if you look at the WordPress twenty fourteen or any other theme, all themes seem to be using h1 tag for widget titles. > should one do anything in the ‘Editor’ section, or just leave it all as it is? Leave it all as is. Creating a child theme is the best idea but you need to write some code so you are back where you started. > all themes seem to be using h1 tag for widget titles. Yes, I know that. But what I want to know is: How do I change it? Each Page, especially the Front Page can only have ONE H1 heading. All the others need to be something else, such as H2 through H6. You’d need to write a little bit of code (I could write it after Christmas). I suggest creating a child theme (or a small plugin) that calls unregister_sidebar() for each of the sidebars and then calls register_sidebar() so that the widget headings are the default h2 (or something else of your choosing). I changed the tags from h1 to the default h2. It would be better to create a child theme, make a copy of header.php and make the change there. If you would like help with this then let me know – go to the contact page on my web site. I tried on a few websites of mine to add the widgets to the home page as instructed but do not appear on either site. I added the services widget to the business template top area and it doesn’t show on the site. I also tried the call to action and recent work widgets and they don’t show up either. Same with the testimonials on the right area. Can you help me figure out what I’m doing wrong? How much did you pay for the theme??? It’s free! You cannot insist on “a better customer service” unless you pay! When you edit a page or post you can enable or disable comments for that page or post. If you want to delete existing comments go to the Comments menu in the Dashboard and delete them. I don’t know where the “you can turn on / turn off comments” section is. Aleksandr, did you eve get a reply. If I can’t remove the comments section from pages I don’t want to invest any more time into this template more than the 8!!!! I already have. I dont see a ‘page attributes’ dropdown to even pick a business template. Are the instructions up to date, or is this me? Hi Lindsay, All instructions are up to date. Please read the instructions carefully and setup your site. And sorry for the late reply. Is there anyway to edit the copyright in the footer? yes. there is a setting in theme options page to change the footer copyright text. I want to know if it’s possible to change the text in the “leave a reply” form at the end of each section on the site and if it’s possible where I can change it in the back-end ? I created a slider but when I added the business services widget to the position of Business Template Top Area (I tried all of the positions), the slider will no longer show. The slider page says it is active. Also, are you going to add an option for social media icons? I had to use a widget but the placement of widgets is too far down on the page. Any way to place the social media icon widget in the header? I am working on a site where I added social icons at the end of the menu. I had to write some code to do this. Let me know if you would like to see the code. I suggest that you create a child theme so that you can modify header.php in a way that will not be overwritten when a new version of THbusiness is released. Hi Damien, Sorry for the late reply. I will give social media icon feature very soon. Thank you! I try to change the text “read more” on each button on all my page. Where I can do this ? All my page are in Business Template model. If you are talking about read more buttons in business page widgets go to widgets.php(inc/widgets.php) and find “Read More” and replace it with your text. But when you updating the theme that will be lost again. The best thing is to make a child theme and edit the widgets.php. Awesome theme! Is there a way to change the slider so that the redirect url link can be the whole slide instead of just the ‘read more’ button? I’m at step 7 for the widgets and I’m looking for the readme.txt document to find the name of the icon for the THBusiness Services Widget. Where I can find this document and where I can have a description of the icon ??? readme.txt file is in your theme folder. Since its using fontawesome icons you can see the names of the icons here. http://fortawesome.github.io/Font-Awesome/cheatsheet/. Just copy the name of your icon and paste it in. I have an other question for you. Where I can change the text “read more” on each button on my site ? Also, where I can change the text “leave a comment” on the blogue page of my site ? You can change them using translation easily. Or if you are using a child theme change the text(“leave a comment”) in content.php. I have thbusiness running on the website I have mentioned in the “website” field above. I love it because it is clear, clean, modern, flexible and responsive. The only thing I did not find outr is: Is it possible to change the size of the flexslider (width and height), but to leave it in the position where it is, or how I can do that by fiddling with the flexslider files and CSS. Is there any possibility to do such changes? If yes, I were very thankful for any information about what I can do. May I please again ask for the topic above? I made my slider less wide by opening thbusiness/inc/extras.php, copying the thbusiness_homepage_slider() function into my child theme functions.php (this function can be overridden). where is the readme.txt file located that is referenced for the services logos? search section is not working ……. why? help me .. This theme is fabulous .. i like so much .. It seems the jquery script for the theme is not loading. However you have disabled the right click. Didn’t it? Some jquery file that you have inserted preventing the script as it seems. I delete the disabled the right click plugin . now same problem is arising ….,, waht to do ? I am pretty new on css. I erased the part “Proudly powered by wordpress” and now my slider with the pics and sentences I had disappeared. Now I checked on the Customization and my slider is activated. Could you help me? I was trying to look for the original css so I can restore it but cant find it online. From where did you delete it? from footer? Can you provide me the link if it is online? Hi, great theme, love it! Is there anyway to control how many service widget are ona row? Now if you have 4 services, you get 1 row with 3 and 1 row with 1 service. Is it possible to get 4 widgets in one row? or even up to the 6? is there a way to control the sizing of them? Thanks! Hi there is not a setting to do that. But you can do it by editing the widget code. As per my previous messages, I’m still struggling with turning off comments. How can I remove ‘comments’ from pages? You have been very helpful! I appreciate it. One more question, where do I find the horizontal bar that automatically shows up on each page displaying what page you are in? It changes based on what menu item you have selected but with what I am doing with the layout, it seems redundant since I don’t have too much copy on there. Just where to find it and how to turn it off would be great! Thank you so much! I would like to know if this wonderful theme is compatible to woocommerce. Thank you for this wonderful theme. I’d like to know if it’s compatible to woocommerce? I used the theme for a client and he loves it and now he wants me to integrate a shop in it. Thank you for this theme! I have a question about the websitename, this appears above the header but I can’t find where I can change the site of the box where the text appears in? This because the name of the website is too long and appears on two rowes and that’s not what I want. I found where to change the size of the text but that didn’t matter because the box of the website name kept the same size (too small). Can i change the “read more” buttons for the services widget into a different text? And another one since I am using your template a lot now :-)…. How do I link a ‘button’ (for example in the call to action) to an email address? Hi armand, sorry for the late. Yes you can. Just give your email address as mailto:someone@example.com in the Button Redirect Link of the widget. Is it possible to freeze the customer logo? So when one scrolls down the page that the logo in the header all the time remains on the top of the screen? Hi – love this theme. Question though, I am trying to remove the social media icons. It allows me to do so by “hiding SSB social” on every page except the home page. Even when I have that box checked, it still shows up. Where can I find it to delete the social sharing options. Also, is there a simple way to remove the “search” option on the main menu? Hi Ann, I don’t have given a social media widget or something with this theme. I think you are using a plugin. I cannot give a direct answer for that. For the second question find the “th-search-box-container” selector from the style.css file and add display:none; property to it. That’s the easiest way. But I recommend if you don’t want that search-box find the relevant code from the header.php file and delete it. very nice theme i love it! I’m using it for my new website, just one question im using the widget Th recent work, but i want use only 3 blocks instead of 4, but if i use 3, the widget is allined on left side, how can i center it? Go to widget.php file. Then find the Thbusiness Recent Work Widget. Then inside the widget() function of that widget you can find a div with bootstrap classes. (<div class=”col-xs-12 col-sm-6 col-md-3 col-lg-3″>). Change the col-md-3 and col-lg-3 to col-md-4 and col-lg-4. (<div class=”col-xs-12 col-sm-6 col-md-4 col-lg-4″>). but now the 3 images became huge and 1 went down (no space). Hi, thanks a lot for your theme. I am trying to use the testimonial part to add articles, and I was wondering if there is a way to add a read more button under the articles that will lead me to a new page. Hi Kati, Yes you can do that if you have a some knowledge in php. Just want’d to say great work, looking forward for the next theme’s. Is it possible du have 4 icons and not 3 at the same line ? You know with the widgets.. ? Your template is so crazy guy !!! Hi, I can’t really understand your question. Can you explain a little bit? congratulations for this theme is very beatiful! since i need the website in 4 different languages, i want to use the plugin qtranslate (i used this one in many websites). In the slider you give the possibility to place text and description, but only in one language, how can i add the other languages? I have been waiting for your reply for my comment dated 4th August. Please see if you can recommend something. I made a page with ‘recent work’ and put a photo in the text area of the page. When I then link it in the recent work widget, it is well linked (correct). However on the home page I do see the title under the recent work part, but I don’t see the photo there. What do I have to do to make the foto visible? Well Armand, You must set a featured image to display the image. Not an image in the text area. You can set a featured image from the bottom of your page. There is a link called “set a featured image”. Thanks for the theme. I really like the ease of setting up the theme. 1. How to rupee symbol to convert Rs / Rs. to the symbol. Webrupee plugin doesn’t seem to work. 2. I want to add a contact number in the header area around menu. What are the possibilities. I am also looking at some visual effect with an arrow etc. For the second question, yes you can easily do it by inserting an extra div to the above area of the site header and give your phone number there. Relevant code is in the header.php file. Thanks Puddu for the reply. I am new to wordpress and trying to learn while solving issues. can you exactly explain via code how to achieve point no 2. Great theme for my website. I was looking for a way to set the size of the slider images. I changed the size of the image but the smaller image is resized to more than full screen. Is there a way to set the image size in the slider? Is the slider responsive? I checked on my android device and found the images are way out of proportion pushing down the content I want visitors to read. Yes there is one way.you have to upload same size images for the slider. Yes slider is fully responsive. Pushing down happens because all slider images are not in the same width and height. So before you upload images to the slider make sure all the images you upload are in same width and height. Hi, I am having the same issue with the slider photos. They appear huge on the screen and I can’t seem to get them smaller even with changing the size of the images and re-uploading them. Also, as the page loads, it first loads the statement that there are no posts to view. I don’t want to put posts on the home/front page because I’m using the sliders and want a static home page. Any suggestions? Finally, how can I make the font size smaller on the Site header so that it fits on one line? Thanks so much!!! I can see your photos perfectly. They are not such huge. Clear your browser cache and reload the browser window again.And what do you need to see on the home page? One page with a slider? or a business page like the demo? If you want one page with a slider first create your page and go to Settings > Reading. Then Select the option “A static page” for the setting “Front page displays”. Then select the page that you created from the “Front Page” dropdown menu. If you want a business page as the homepage please read the documentation. change the font size of “.site-title” selector. This is an excellent theme you’ve created, thanks a lot! Just to clear that out, when on a mobile device, you can’t stop the slider from changing picture. It would be nice to have that feature. Thank for the good job on the theme. Could you help me tune the recent work widget to show posts instead of pages? Hi, your theme is realy nice! I’d like to know how to delete the search-box from all my pages. I have already turned off all the widgets but the search-box is already on all pages of my website. Thanks Knille. 🙂 There are two ways to do that. First and easiest way is hiding it using css. (Using display:none;) Or you can delete the code from the header. I want to add a dropdown menu. How can i do that? Hi! Great theme! Thank you for it. Question: Is it possible to make two or more business pages with different sets of sliders? I am making web page with 3 languages and would like to have start – business – page with sliders in each language. Sorry Blazej, for now slider displays in the front page only. when i try to add widgets in top area —> no results , nothing appear i followed the steps in your tutorial i want to a home page with 3 kinds of service that’s so what do you think ? Hi Jessy, Doesn’t work means what happens when you trying to add it? Im using the THBusiness Services Widget and wanted to know – is there a way to specify where the excerpts end? See http://www.lisa.bpccreative.com/ underneath the slider as a reference. Any help would be appreciated!! It’s now using 30 words as the excerpt. But if u want you can edit the code to get your job done. I will definitely give that feature in the next theme update. Thanks, it will be useful for me too, I would like to control the excerpt and stop it a the end of a sentence. I have set up the Widget but it not appearing on the home page? Hi guys, thanks for the theme, great work! I can’t find a social section for the theme – I only need to add a facebook link/ icon on the main menu (or somewhere in the header). Am I missing something 🙂 ? No you didn’t miss anything Adrian. We hope to add a social media widget in our next theme update as it is a main requirement for the theme. We will do it very soon. Thanks. Thanks for this perfect theme, I love it. Can you tell me how can I translate the “Read More” button into french ? To do that you have to edit the .mo file which is in the languages folder. Editing can be done by the Poedit software. Theme can be fully translated to french. 🙂 Thank you for using THBusiness. After translation, how do I rename the file ? Do I have de to replace the default.mo ou create a default-fr_FR.mo ? I do also need a greman translation. Thanks, this video helped with my language file loading problem. You can’t just translate the default file and reupload it, you have to put additional one with your language, for example fr_FR.mo. Hey, how do I change the text color on slider? You can use custom css to change text color on slider.